I scanned it for Buddhist references. There is one scene with a stupa, that Captain Haddock wrecks when he bumps into it. Of course the setting in the mountains give it a sense of place. They go to a monastery, where there are a bunch of monks. They have yellow hats, which makes them Gelugpa. One of the monks can levitate, and can sense where a person is from an article of clothing, and then denies it to be mysterious. I don't really like the Yeti part of the story. 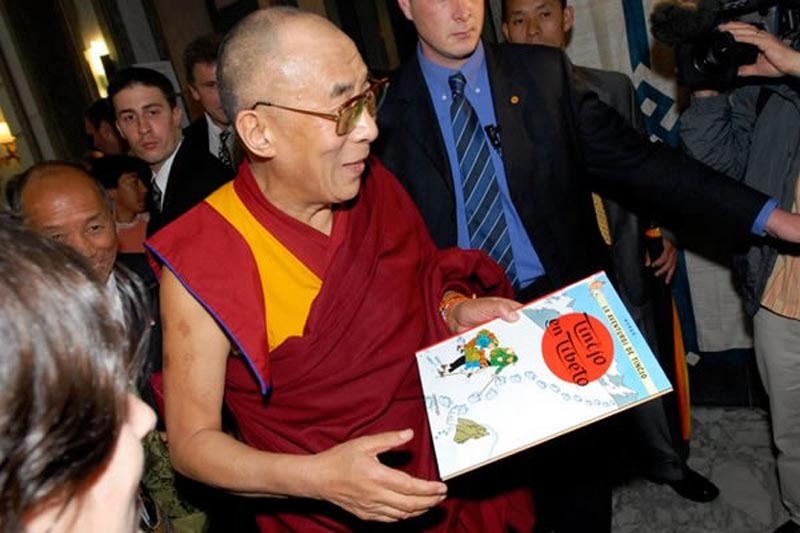 Herge wrote it before the invasion, and flight of the Dali Lama, in 1959 by China, but it was published in book form in 1960. The Dali Lama said, "For many people around the world Tintin in Tibet was their first introduction to Tibet, the beauty of its landscape and its culture. And that is something that has passed down the generations," and he gave it an award. Supposedly the author Herge was having difficulty at the time, falling out of love with his wife and falling in love with his younger assistant, according to the wikipedia article.